Growing up in north-central Alabama, I saw and learned to track many different types of wildlife — from deer to quail to coyotes and so on … game was always abundant, all you had to do was know where to look. 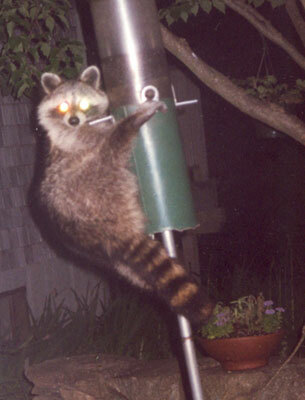 Raccoons were never in short supply. We had a small creek that ran behind our house fed by the Warrior River — I can count on one hand the number of times I saw it dry. I could always count on seeing their prints in and around the creek (after all, crawdads could be easily found! ), around my mother’s fruit trees encircling our house. I’m sure they probably nipped a bite or two from my dog’s food dish as well … over all, they were never a problem. I love animals. I love all living things. (well, except a few…) I love all things cute and fuzzy, and that most definitely includes raccoons. How could I not? After all, like the guy in the article says “They’re cute as a bug’s ear”.